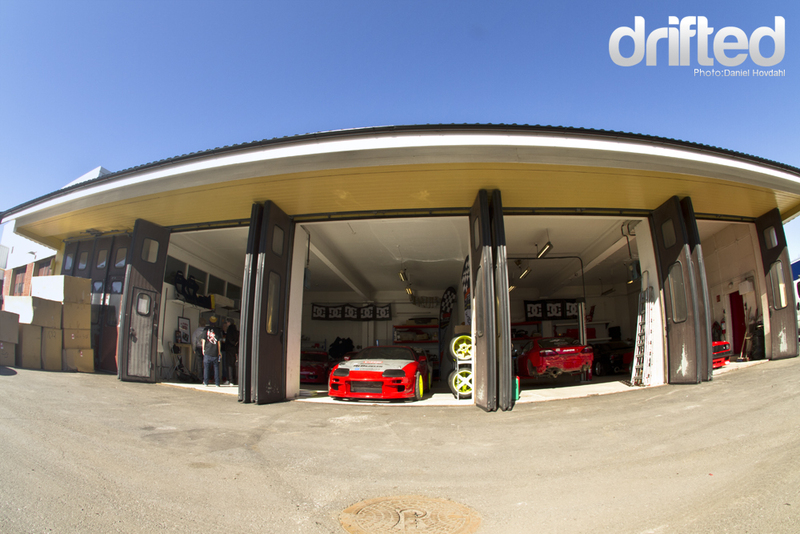 A sunny Saturday morning, I hitched a ride with a train across Oslo and beyond to check out the DriftMonkey garage and to see how they were getting on with the pre-season preparations of the team cars. Click the jump to read more! 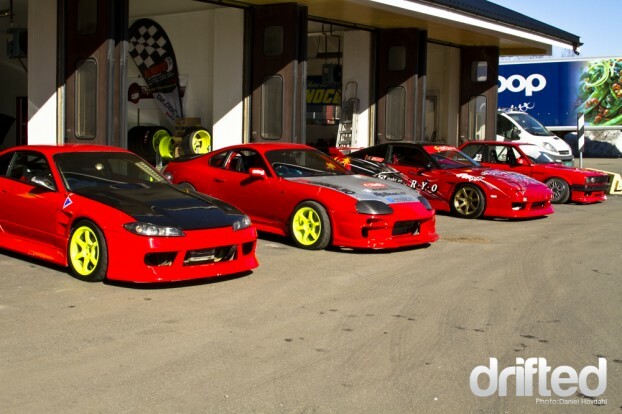 Here’s some of the ones on the Team, Fredrik Øksenvad, who drives a Toyota Soarer, couldn’t be there as he is in the process of moving. From left to right: Ove Harlem is the owner of DriftMonkey and the team chief, Joacim Flatby Nielsen is the driver of the red BMW E30, although he is only partially sponsored. Next to him is his little brother, Kristoffer, who will drive his first season in his personal S13. Then there’s Kim Hofgaard who will serve as a mechanic and hangaround this season. Last but certainly not least, is Tor-Anders Ringnes who is piloting the red Supra you see on the trailer. It isn’t a 100% ready, but I saw it doing a few test runs in the parking lot. Damn it was fast! 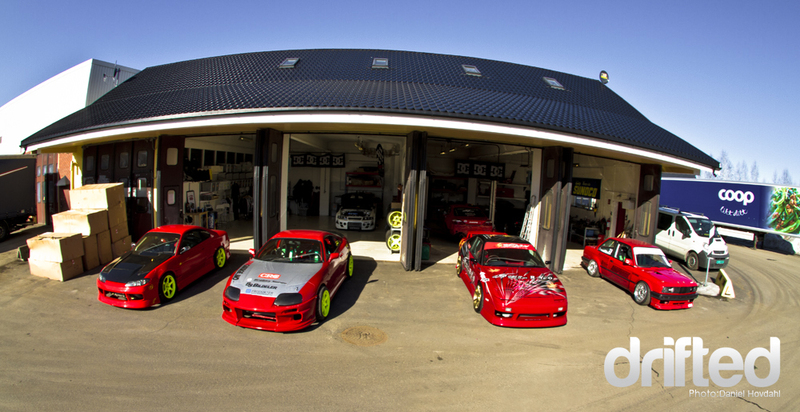 Here is the lineup of the cars. 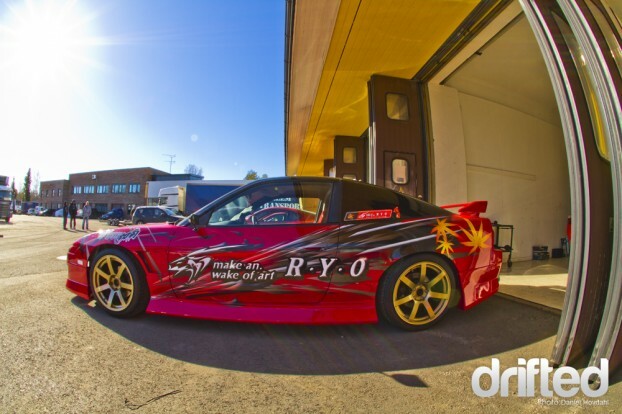 One of two S15‘s, both used by the famous Japanese drifters ‘Nomuken‘ and ‘Murata-san‘, this one with an SR20, Ringnes’ Toyota Supra pushing out 580hp and 775Nm (571Ibs), the Ryo 180sx which currently is for sale through Ove, then finally Joacim’s BMW, inline six, E30 which you can read more about here . Ryo’s old 180sx is an immaculate piece of a Nissan. Straight import from Japan, since then it’s just been sitting in the shop waiting for someone to dig in their pockets and take her home. Here again is the SR20’d S15. Ringnes and Kim taking a look on the Monster EVO in the background. That thing is SAVAGE, full on drag-spec. 561.1bhp on the wheels, combine it with an anti-lag system which boosts at 1bar when you’re off the throttle – buckle up! 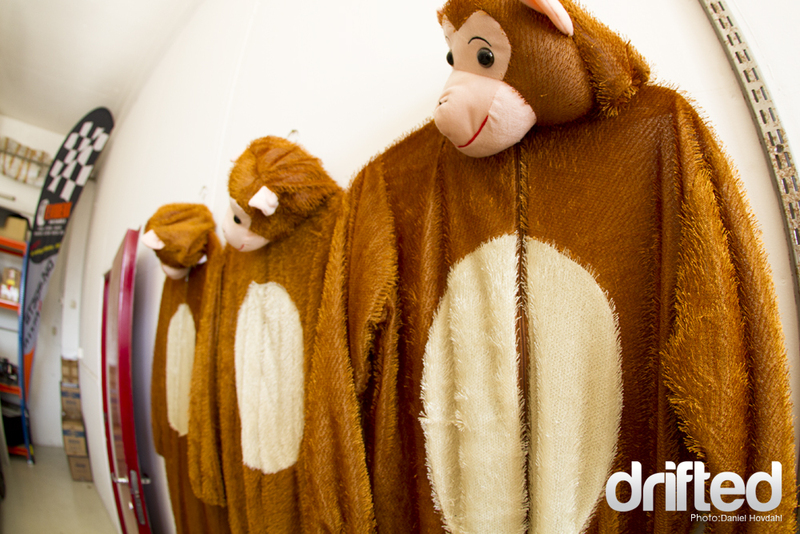 While peering through the shop, I spotted these rather quirky monkey suits hanging on the wall. 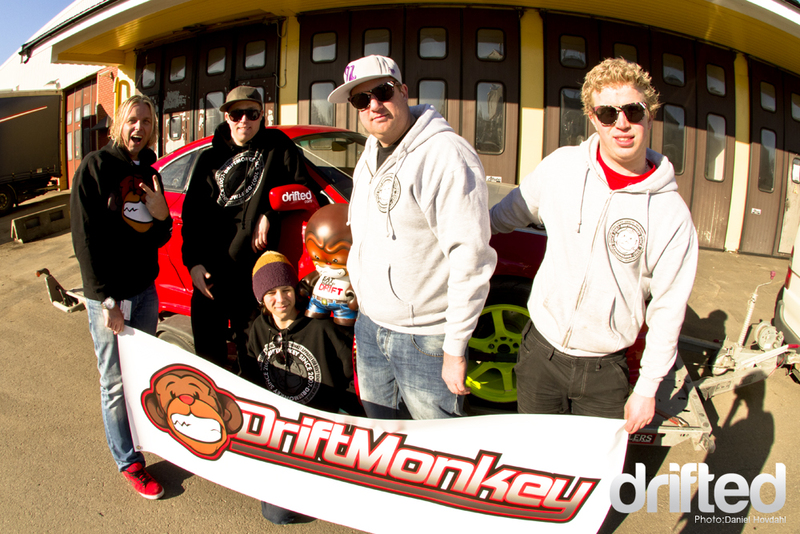 The drivers will run around in these at Gatebil this summer – hopefully throwing bananas around, causing havoc in the pits! 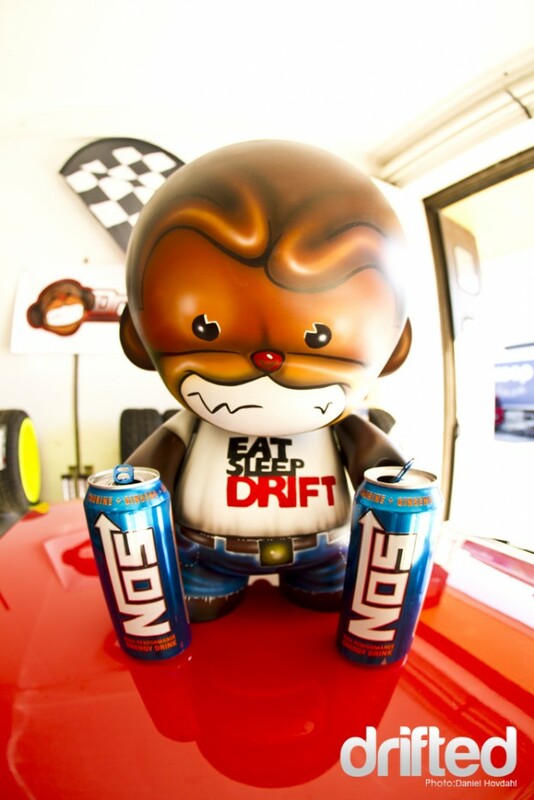 Speaking of Monkey’s… Here is DriftMonkey’s new mascot! A Be@rbrick custom airbrushed by the very talented Maria Elena! In the other garage, Joacim’s car was sitting as low as always. Everyone takes a closer look on the stance on it. He says it could be a little lower! Gonna take a little break now, do a new shoot for you’re eyes to feast on a little later. Part two, coming soon!